COOKIES for the survivors!” yelled Nelson cheerfully as we climbed up a muddy slope made slippery by the driving tropical rain. It was not the right sentiment to warm the hearts of the dozen or so tourists about to voluntarily zip from treetop to treetop 400ft above the ground. Nelson was our guide on the famous canopy tour, offered wherever there’s a rainforest in Costa Rica. In this tropical Central American paradise (where Jurassic Park, 1993, was filmed), that is just about everywhere. 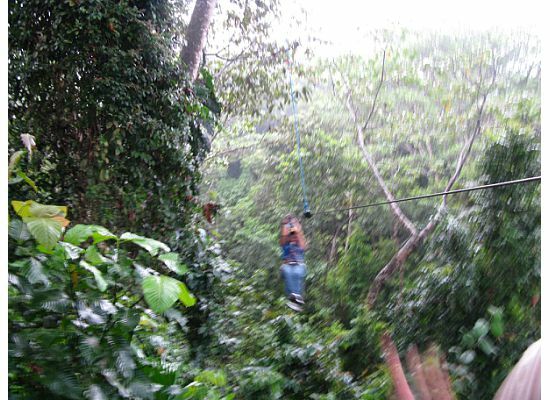 On a canopy tour, visitors are strapped to a harness, which is attached to a thick wire cable strung between tree trunks. You assume a sitting position (on an imaginary chair), clutch the cable with one gloved hand, and whoosh! you’re off. Some cables stretch as long as 1,500ft, some soar 400ft above the ground. Each one is exhilarating, and makes you wish you had a third hand with which to take pictures of mist-shrouded valleys and tree-studded hills. It was our first day in Manuel Antonio, Costa Rica, and we meant to make the most of the adventure tourism the country was known for. From a surfeit of options—ATV (all-terrain vehicle) tour, scuba-diving lessons, hiking, horse riding, jet-skiing, snorkelling, sunset sail and rappelling down a waterfall—we had decided on the canopy tour and waterfall rappelling. I was nervous about both, but a friend’s jibe—that during an earlier attempt at bungee jumping I resembled “a granny jumping off a cliff”—had to be expunged. My upper lip stiff as a starched sari and my lower lip trembling uncontrollably, I positioned myself and clung to the cable. Before I was ready, my body had taken off, zipping along the wire at a bracing clip. Nelson’s instructions ran through my head and got all muddled up, so that I braked when the guide urged me to speed up and my body swung alarmingly from side to side when it was supposed to slide along smoothly. But then I looked down and forgot about being scared. The green stretched out under me, the rain falling in hard pellets that created a curtain of drops, my breath caught at the natural beauty and, all too soon, my legs hit the ledge on the other side. The guide was disengaging my harness—it was over. There were cookies, and we all survived. 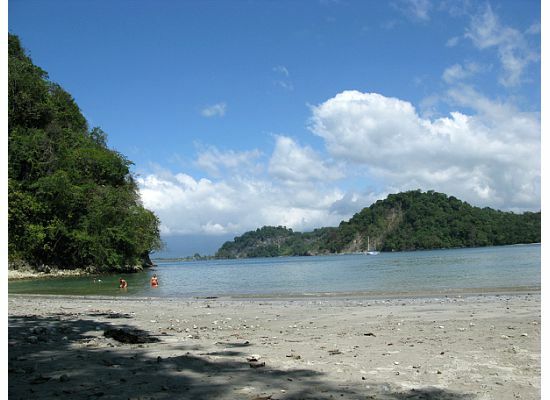 As a “reward”, the friendly concierge suggested a visit to Biesanz beach, one of the seven, semi-private beaches of the Manuel Antonio Forest Reserve. Costa Rica boasts of everything from an active volcano and hot springs (Mount Arenal) to a challenging river for white-water rafting (the Pacuare river) to beaches on both the Pacific and Caribbean coasts and rainforest everywhere in between. The government controls seven different forest reserves, of which Manuel Antonio is the smallest. The town itself offers both the rugged beauty of the forest as well as proximity to beaches. The beaches of Manuel Antonio are more secluded than the public beach at the nearest town, Quepos, because they are not easily accessible. Biesanz required a 10-minute walk on the unpaved road, and an additional 10 minutes on a path littered with potholes, roots and rocks. It was small and clean with roughly equal numbers of locals and tourists. There was a guide boat for snorkelling, but we spread out on beach towels and spent the rest of the day in the shade. In retrospect, it was just as well we conserved our energies. The waterfall where we would be rappelling was 45 minutes away in an ancient, open four-wheel drive. The potholes in the road—some several feet deep—ensured our bumpy ride was an adventure sport in itself. By the time we reached the rest stop in a remote part of the rainforest, our muscles were aching from holding on tight to the vehicle. Our guides strapped us into harnesses similar to those we had worn for the canopy tour and, after signing away responsibility for our possible deaths from the tour company, we started climbing. At the top of the waterfall, there was a cool, pellucid pool which we dived into at our guide Eric’s insistence. The forest stretched out in all directions, the shades of green balm for my eyes. The sun was warm on our wet backs as we clambered out and clustered around the guide to hear his lecture on how to get down the waterfall. In preparation for our adventure, I had worn cotton shorts (which would dry easily), a loose T-shirt (for easy movement), and sneakers. “These are the worst shoes to wear,” Eric declared, pointing at my sneakers. The “Nikes” (his pronunciation rhymed with “bikes”) were the most slippery on wet rock, he explained. That’s why he was wearing Crocs. “They should have put that on the brochure!” I thought crossly. Indignation, though, was rapidly replaced by anxiety as I peered down the first, 45m cliff. My turn came almost at the end, and I was glad for the wait. I had studied each person’s descent, marking the trouble spots, observing different techniques, practising hand positions, swallowing frequently. One of the first to go down had been a 71-year-old grandfather who, as he told everyone, had metal knees that didn’t work too well. He had rappelled down like a pro, confident and strong. One young Indian-American woman, petrified, had to be talked through and cajoled every step of the way, taking three times as long as everyone else. And then there was one of the guides, who jumped down without a backward glance, sometimes going sideways, moving from boulder to boulder with all the agility of a goat. And so I didn’t think, just leapt. I even fancied my style to be goat-like as I went down in my slippery Nikes, not falling even once, not looking down, not giving myself the opportunity to feel scared. And when I reached the bottom, I felt triumphant. Still, no one was going to call me a granny now. Indians with US/UK/Schengen/ Canadian visas valid for six months can get visas on arrival in Costa Rica. Alternatively, contact WH Brady & Co. (14/15 F, Inner Circle, Connaught Place, New Delhi-110001, Tel: 011-23310212, 23314934) between 10am and 1pm with your travel itinerary and other papers for clearance for visas on arrival. Rs500 is charged for processing; visas cost $25 (around Rs1,000). You’ll need to use an American or European gateway to reach Costa Rica. Depending on how early you book and the time of year, air tickets to Juan Santamaria Airport in Costa Rica’s capital San José can cost as little as $250. Consult your hotel for the way ahead: Many hotels pick up their guests from the airport. Two local airlines, Sansa Regional (www.flysansa.com) and Nature Air (www.natureair.com), also offer convenient connections. 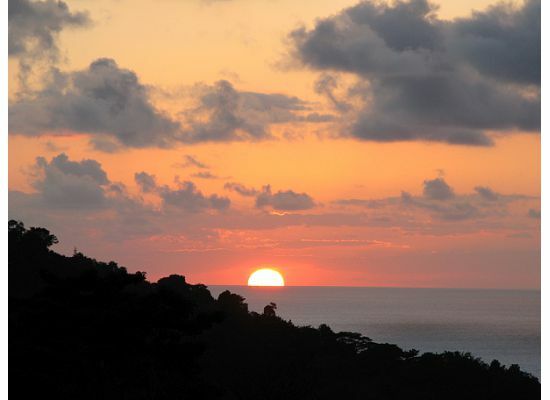 Costa Rica, being a tropical country, gets hot and rainy in summer so November-February is the best time to go. Naturally, hotel rates spike sharply during these months, though peak season can last till end April. An inexpensive option in Manuel Antonio is Vela Bar (www.velabar.com), where rooms in peak season begin at $40 and go up to $63. Hotel Byblos (www.bybloshotelcostarica.com/index.html), which advertises a casino, is priced upwards of $160-230. Hotel Mango Moon, walking distance from Biesanz beach, offers rooms at $150-350. For more luxurious accommodation, check out Issimo Suites (www.issimosuites.com/ costaricasuites.html). In peak season, rates range from $295 to $765 a night. Anything you have the stamina for! Options include hiking, scuba-diving, horse riding, ATV tours, sunset sails (they take you to a private beach, chase dolphins and give you dinner on board while you watch a magnificent sunset—but book early, these tours get full fast), white-water rafting, and more. Ask your hotel concierge for details. In Quepos, try Monchados for excellent Mexican cuisine. They had the best calamari I have ever tasted, and make a mean Mojito. La Lanterna is a decent bet for Italian food, and the server usually has good recommendations. Barba Roja in Manuel Antonio is great for the views, so order some drinks and drink in the sunset, but eat dinner elsewhere. Tourists generally like El Avion, in Manuel Antonio, where a bar sits inside a Cold War aircraft, the twin of one shot down in Nicaragua during the Iran-Contra scandal. The plane is interesting, but the food is unremarkable. Better to go where the locals usually eat; restaurants such as El Avion tend to be tourist traps. This article was published on 19 October 2007 in the Indian newspaper Mint. the reason why I cannot subscribe to it. Is there anybody else getting similar RSS issues?